Let’s share insight and practical ideas. Let’s blend fun with function, and let’s ALWAYS HAVE A BACK-UP PLAN. We need to have tools and tricks “up our sleeve” to catch and keep kids’ attention when unexpected disruptions occur. Δ Computer goes down just when you’re about to show a video on the Prometheus or Smart Board. “How smart is that Smart Board now,” you mutter to yourself. Δ Rain starts pouring five minutes before recess, canceling your class’ much-needed outdoor break on test-day. Δ Field trip gets cancelled because the bus broke down. Δ Storms in your vicinity cause a power outage. Yikes…it’s no wonder that teachers need back-up plans! High-five for Plan B! 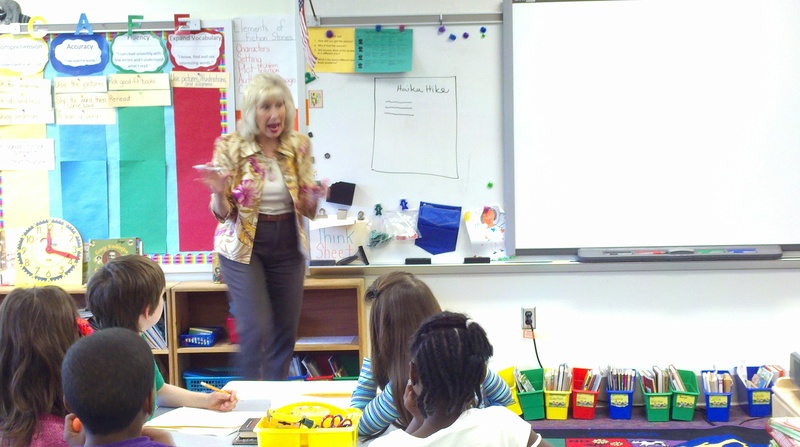 – When disruptions occur during a school day, teachers are challenged with preventing a lot of lost instructional time. 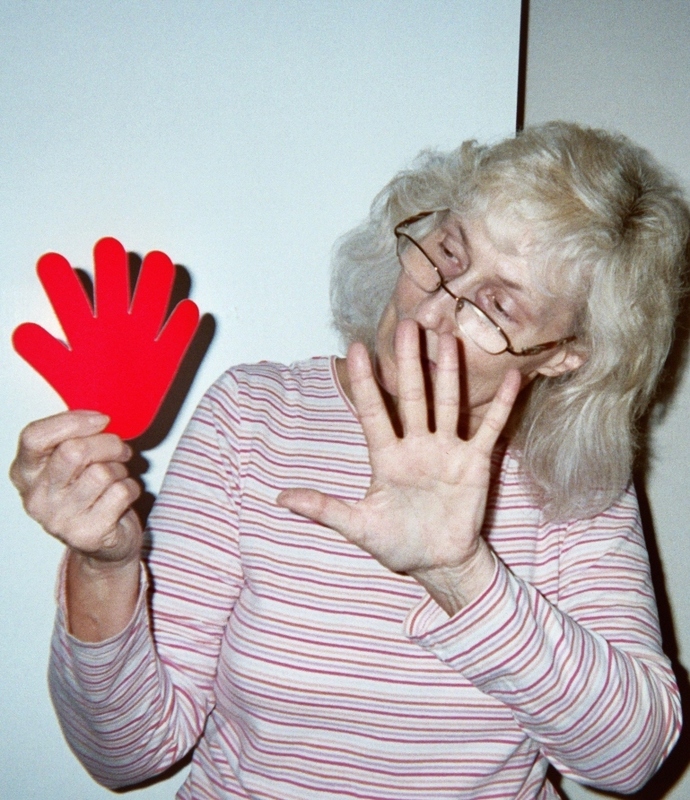 Hold up a cut-out hand, like you see in my blog pic here, to send the high-five message. Or simply hold up your hand and ask everyone to join you in a high-five for Plan B! Say those words with commanding enthusiasm. You’re advising the class to get ready for an alternate activity. Turn disappointment into opportunity. (Isn’t that what back-up plans are!) Tell the class that you have a special way to “head outdoors.” Watch for questioning eyes on you. Write Let’s Go Haiku-Hiking! on the board, like you see in my blog pic below. Ask the class to watch you write a haiku in 3 lines; write: The kitten/Holds down a leaf/For a moment. (Note that the line breaks are indicated with a slash mark.) English-speaking students that are familiar with haiku may tell you that your poem should have a 5-7-5 syllable structure. Explain that the haiku you just posted was first written over 1,000 years ago in Japanese characters, not letters of the English alphabet, by a Japanese poet named Issa. No 5-7-5 syllable structure. Tell the class that you’re giving them permission to be free with syllables, as long as they write haiku poems in only 3 lines. What to haiku-hike and write about? Here’s where you can make a connection with the cancelled activity. Let’s say, for example, that your class was set to enjoy a field trip to a nearby nature center. Just like magic, you can go there with imagination! Add some fun to your Haiku Hiking. Tell students that after they (pretend to) head outdoors you’ll all “meet up at the campground.” The “campground” is simply a center space in your classroom. When you “meet up” distribute marshmallows. No need for toasting; let’s eat! Campground Poetry Reading – Invite student volunteers to entertain the class by sharing haiku poems they’ve written on their imaginary hikes. At first glance, having to resort to a back-up plan may be “a bummer.” Remember what the American poet, Emily Dickinson, wrote…Dwell in Possibilities!